Grilling Baby Back Ribs, Sweet, Succulent And Flavorful. Baby back ribs originate from the rib and center section of the pork loin. 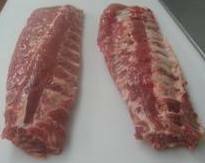 The whole loin is deboned resulting in back ribs usually 11-14 ribs weighing anywhere from 1¼ to 2¼ pounds. Back ribs are usually less meaty, leaner and tenderer then spareribs (side ribs) which come from the belly of the pig, where bacon comes from. 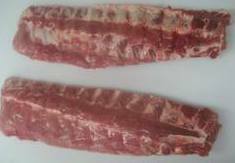 Baby back ribs are not from a baby pig, they’re simply smaller than spareribs, the names baby back ribs and back ribs are interchangeable. Some suggest anything under 1¾ pounds are called baby but restaurants regardless of size call all back ribs recipes baby. Grilling baby back ribs at home can result in tough dry ribs, not the tender juicy slabs you find in some rib joints. Because back ribs are less fatty than spareribs (side ribs), brining them in a salt and sugar water solution followed with a dry rub will produce a tasty, moist fall off the bones meat. Ribs have a skin like membrane located on the bone side of the ribs which many debate whether it should be removed or left on prior to cooking baby back rib. Some say it prevents smoke and spices from penetrating the meat and some experts say that removing the skin robs the ribs of flavor and moisture. We found that leaving the skin on did not interfere with the flavor but the skin left on will make the ribs a little more chewy. When grilling baby back ribs we prefer to remove the skin. If you're careful and lucky, you'll get the membrane off in a single piece. The membrane on back ribs may shred when pulled off, so you may have to pry up a few remaining bits and pull them off. 1. If the back ribs you have purchased are seasoned or enhanced skip step one. For each unseasoned rib dissolve ½ cup of kosher salt or ¼ cup of table salt and ¼ cup of sugar in 2 quarts (1.9 liters) of cold water in a large pot or plastic container. Let the ribs sit for 1 hour in the brine solution. 2. Remove the ribs from the brine and season each side of each rib with 1 tablespoon of a BBQ dry rub 30-60 minutes in a large plastic food bag or container in the refrigerator. For a more potent flavor keep in refrigerator 4-8 hours or overnight. 3. About 30 minutes before cooking the ribs remove from the refrigerator, unwrap to bring it to room temperature. This next step is optional, to add a southern smoky flavor soak 2-3 cups wood chips covered in cold water about 15 minutes, drain and place in a metal wood chip box which can be found where most grills are sold. 4. Place tray with wood chips on the grill and turn on all burners to high. Close lid and preheat 15-20 minutes until the wood chips are heavily smoking. If not using wood chips preheat grill for 15 -20 minutes on high. 5. Turn the burners down to medium on half the grill. Turn the burners off on the other half of the grill. Scrape the grill clean with a wire brush, place the woods chips over the heated half of the grill and place the ribs over the cool part of the grill and close the lid. Try to keep the temperature about 275 degrees, adjust the heated burner as necessary. Cook for 4 hours with lid down turning ribs every 30 minutes until the meat easily pulls away from the bones. An optional barbecue sauce can be brushed on the final 30 minutes of grilling. When turning the ribs or brushing on a barbecue sauce work quickly to close cover and retain as much heat as possible in the grill. 3. About 30 minutes before cooking the ribs remove from the refrigerator, unwrap to bring it to room temperature. Soak wood chunks covered in cold water for 1 hour and drain or soak wood chips 15 minutes and drain, place in an aluminum or tinfoil container. Cover container tightly with foil and use a fork to make about 5-6 holes to allow the smoke to escape. 4. Meanwhile, light a fire filling about ¾ with charcoal briquettes and allow to burn until covered with a thin layer of gray ash. Move coals to one side of the grill, piling 2-3 briquettes high. Open bottom vents completely and place wood chunks or the containers with wood chips on top of the charcoal. 5. Open grill lid vents completely and cover, turning the lid so that the vents are opposite the wood chunks or chips to draw smoke through the grill. Let the grill heat for 5 minutes and clean with a wire brush. 6. Place ribs on the cool side of the grill and cover. Cook for 4 hours turning every 30 minutes until the meat easily pulls away from the bones. After 2 hours on the grill add 10-12 briquettes and switch the ribs so that the rack nearest the fire is on the outside. An optional barbecue sauce can be brushed on the final 30 minutes of grilling. Grilling baby back ribs will now become a family favorite.